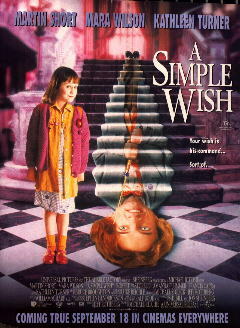 When Annabel (Mara Wilson) makes her wish she encounters the only fairy godmother who wasn't at the annual convention -- Murray the male, not very competent, first-timer fairy godmother (Martin Short). Annabel's wish that her actor/singer father win a role in a musical sounds simple enough, but a combination of her wandering mind, Murray's incompetence and the machinations of evil ex-godmother Claudia (Kathleen Turner) and her ex-dog. A comedy of errors (literally) liberally filled with slapstick, good comedic timing and special effects, A Simple Wish has enough to keep both parents and kids amused.